Here is a list of two best free Knitting Software for Windows. These software will help to design knitting patterns on your PC. Both these software are meant for different tasks. One of these let you design knitting patterns, while the other lets you only view knitting pattern, in a three dimensional view. 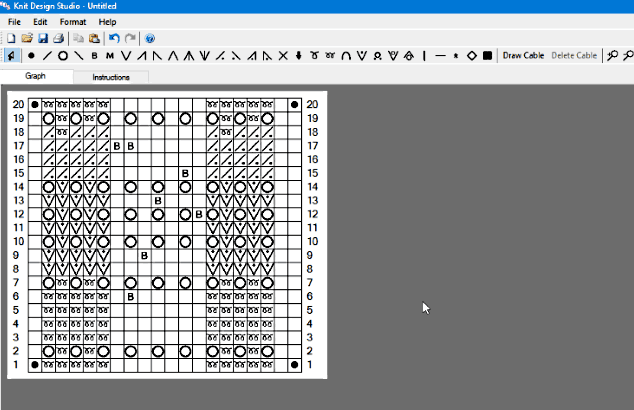 One of these knitting design software lets you draw knitting pattern on graph of custom grid size. You can design knitting patterns with the help of various symbols available on-board. You can even add text instructions to a design using this software. It not only lets you save a design, but you can also export design as image or directly print it. Another software listed here is a knitting pattern viewer, which lets you view KnitML files in PAT format. You can view a pattern in 3D, simulate pattern under various gravity values, and even view knitting structure in different rendering styles. Knitting patterns can be easily rotated to examine in 360 degrees view with this free knitting software. You will get to know how to design knitting pattern, and also know how to view knitting pattern in 3D using these free knitting software for Windows. You can also checkout the list of best free Cross Stitch Design Software for Windows, T-Shirt Design Software For Windows, and Interior Design Software for Windows. Knit design studio is a free knitting software for Windows. It lets you draw knitting patterns digitally using various symbols and cables on a graph of desired grid size. Along with the design, you can also add written instructions. After designing a knitting pattern, it also lets you Save, Print, and Export it. The export option for designed knitting pattern is available in JPG format. Let us know more about this free knitting software in details. There are two tabs in the interface of this freeware, namely Graph and Instructions. In the Graph tab, you can create knitting pattern. In the Instructions tab, you can write textual instructions based on the design. You can begin to design a knitting pattern after deciding the grid size of graph. Once the size of the graph is decided, you are not bound to work on the same graph size. According to your requirement, you can easily increase or decrease the graph size. Be careful while reducing graph size, as it may cause loss of designed pattern. There are a lot of designing symbols available on the top of the interface. These symbols are named by default according to the software, but they can be renamed. You can insert and remove symbols in the knitting pattern design just by a single click. To insert a symbol in the grid, select the symbol from the toolbar and click wherever you want to insert it. A single right click on a symbol is enough to remove it from the designed pattern. Also, you can add straight cable lines of the desired length with the help of Draw cable tool. The Delete cable option lets you delete drawn cables easily. In Knit design studio, you also get options to Copy and Paste patterns. It can help you save a lot of time when it is required to draw the same pattern again. It also lets you use brackets to point out the specified pattern area. Redo, Undo, Delete, Delete Bracket, etc. options are also available. Zoom in and Zoom out options are available for better inspection of drawn knitting pattern. If you are having a hard time understanding how this free knitting software works, you can use the Help tool. It explains how to use various tools that are available with this software. Knitter is another free knitting software. It basically just allows you to view knitting patterns in a three dimensional view. Knitter supports PAT (pattern) file format to Open and Save files. So, if you have a PAT file to view, you can make use of this knitting software. For a loaded knitting pattern file, you can play its simulation under different Gravity and Timestep values. It also has some tools that let you analyze knitting patterns, by viewing them in different structures. You can also select background color according to your choice for better analysis of loaded knitting pattern in this free knitting software. Some preloaded knitting patterns in PAT format are available for you to view and analyze. You can select any of these patterns to get their 3-D view in Knitter. Rendering Style: There are various rendering styles available to render loaded pattern. 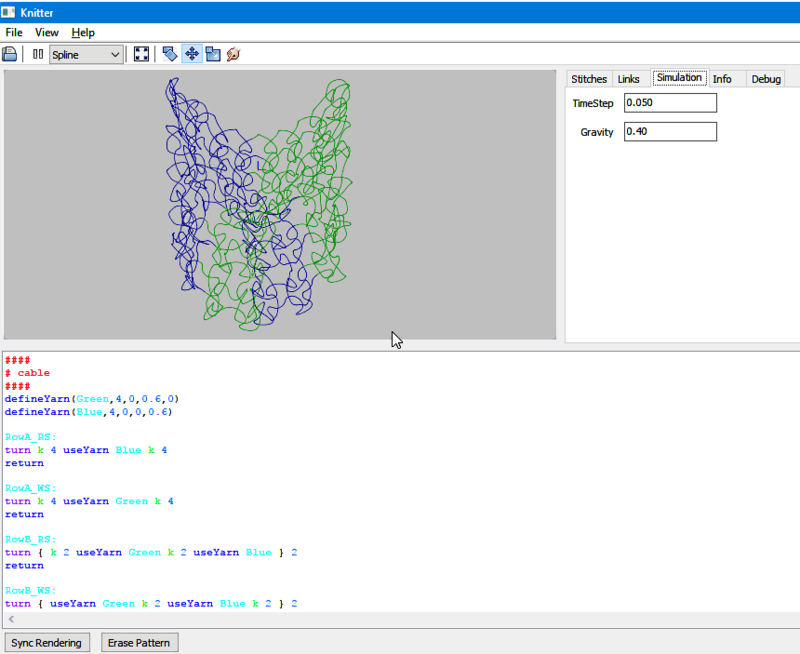 You can view a pattern in Spline, Tubes, Wireframe, or By type rendering modes. Rotate: You can rotate and view a loaded pattern in 360 degree view. For this, use the rotate tool. It lets you freely rotate a loaded pattern, making it easy for you to analyze it. Translate: Using this tool, you can drag and move a loaded pattern in a 2 dimensional plane. Zoom: This tool lets you zoom in and zoom out to view patterns closely. On the right side of the interface, there is a Side panel, where you get various tools related to pattern rendering and simulation. There are various options available under different tabs in Side panel, such as Stitch, Link, Simulation, etc. Using Simulation options, you can change the Time step and Gravity values. This simulates the rendered pattern according to the values set. The Stitches tab lets you set Needle size, Yarn weight, and set background color. There are few options in Debug and Links tabs, but they didn’t seem to work properly. Right below the pattern viewer window, a separate window is available, where you can view information related to the loaded pattern. At the bottom of the interface, Erase pattern option is there, which erases the loaded knitting pattern.